Our visit to Stubbs demonstrates one of the advantages of writing a blog; we have opportunities to try wine at wineries that are not open for public tastings. 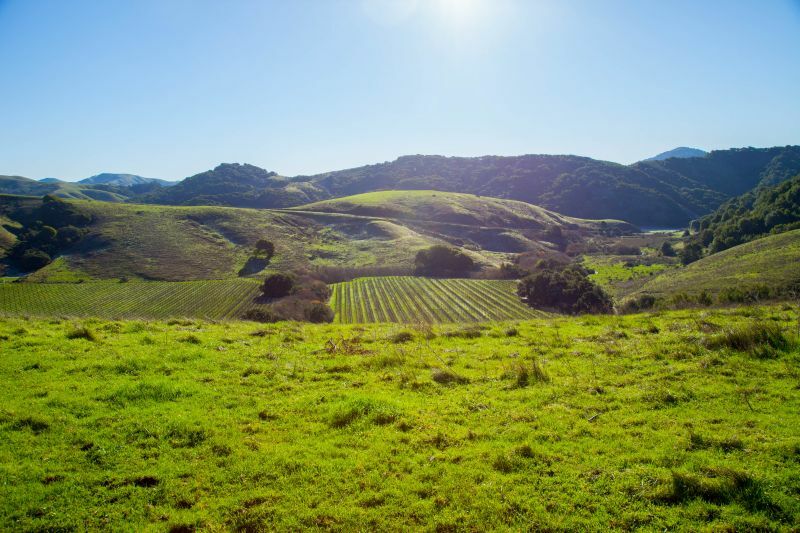 Stubbs Family Vineyard lies several miles out of the town of Petaluma. We drove out early on a Sunday morning in December; with shaded patches of grass still glimmering white from the overnight frost. 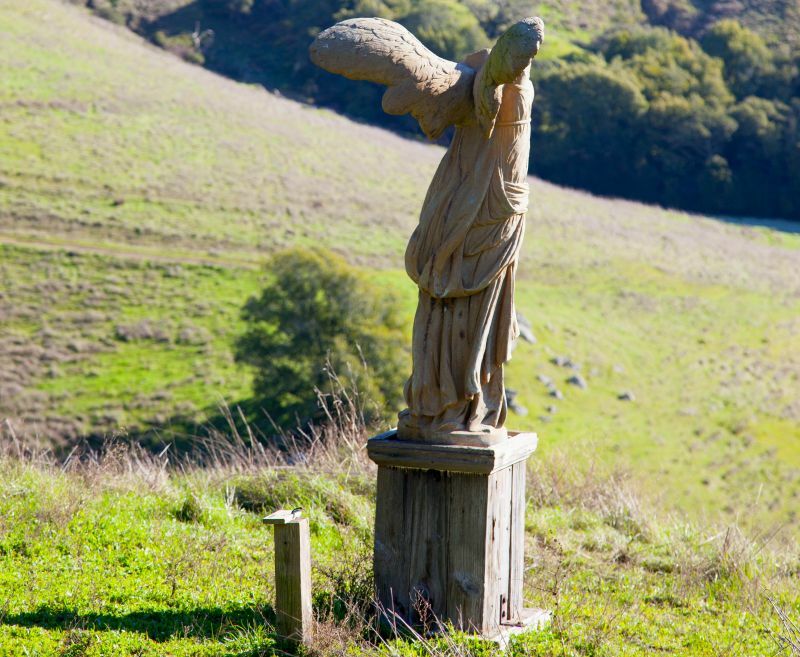 The road twisted as it climbed up the hills that separate Petaluma from the coast. The instructions told us to turn in at a gate with a black mailbox and that if we saw the sign for Stubbs Vineyard we had driven too far. We saw the sign and had to backtrack. We then carefully made our way down an un-paved track lined with Olive trees until we arrived at an unusual styled wooden home. Across the garden we could see an even more stringing wooden tower; that reminded of an English folly. There was no sign announcing Stubbs Vineyard; a further reflection that they do not offer tastings to people who drop in; not that this a place that many people are going to pass by. This is the workshop for the farm. I loved the architecture! We were greeted at the door by Mary Stubbs; the owner and performer of most of the other roles needed for the vineyard. She drove California Girl and I in an ATV across several fields, including in which emus were grazing, to a spot that looked down on their vines; six and half acres of Pinot Noir and four and a half of Chardonnay. Mary explained that having studied at Davis she had identified that this part of their estate was ideal for these two grapes. She had planted then in 1996 and they had delivered the first wine in 2002. They also have a thousand olive trees from which they make their own extra-virgin olive oil. California Girl comments: Meeting Mary Stubbs was interesting. She is a woman with passion and vision with an eclectic style about her. I could sense her fierce determination in our conversation, and her love of her land and her grapes which are her babies. 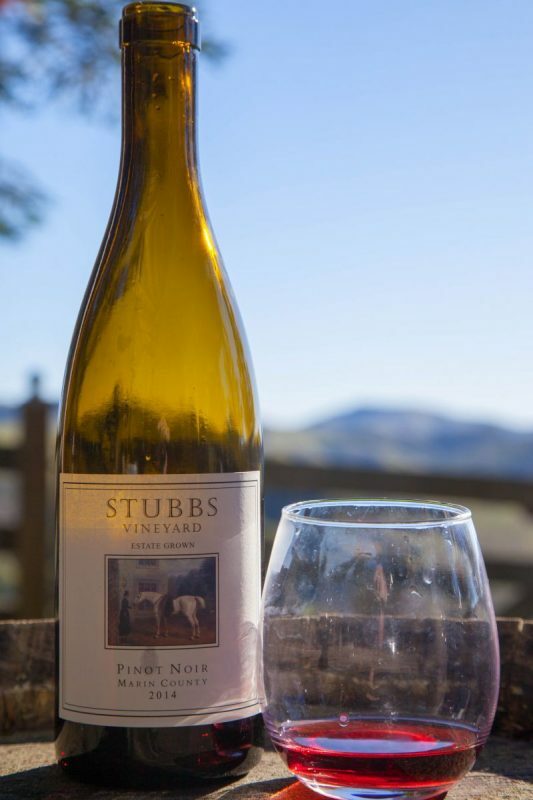 Clearly, Stubbs is not a large winemaker; their largest annual production was two and a half thousand cases. They sell their wine to club members, who get a case a year. The rest of their production is available in various San Francisco and Bay Area restaurants; including the Slanted Door in the SF Ferry Building. California Girl comments: Again, being such a small winemaker its a huge boon to sell out of the fine restaurants she does. Everyone wants name recognition, and Stubbs isn’t well known. She does the marketing herself (referring to herself as a one woman band). I was really impressed as I wondered where she finds the time and energy to do it all. 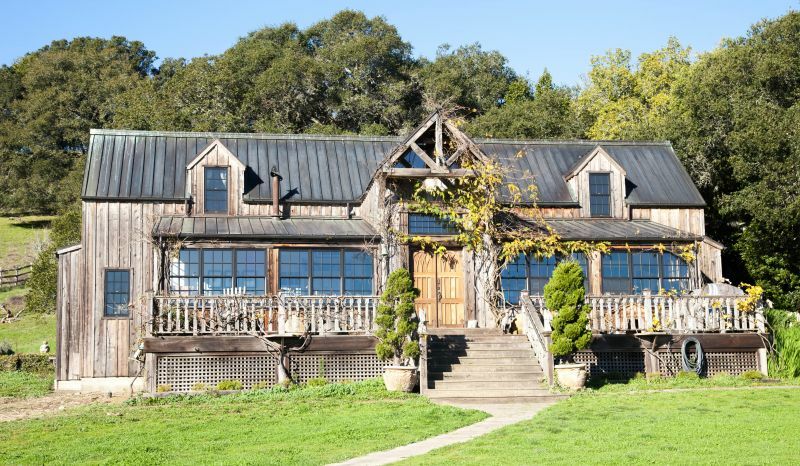 Another interesting thing to note here is that the owners of this winery are protecting the environment by being completely off the grid for its power, and have partnered with a local land trust agency to ensure that the land doesn’t get bought up by builders who will spoil its beauty. Their goal is to leave as small of carbon footprint as possible while producing the highest quality product. It’s all very impressive. This is their “Tasting Barrel” Its a huge what looks like a wine barrel that looks over the vineyards on the hill. 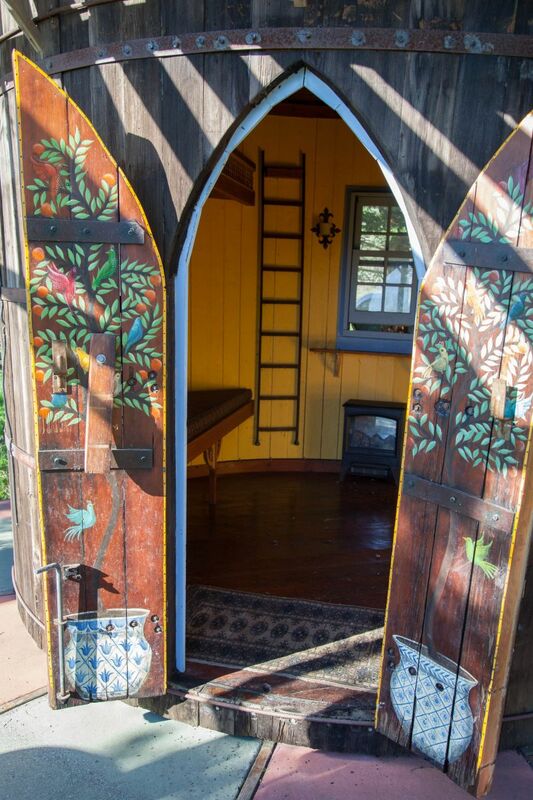 It reminds me of Nordic shacks. Very cool and unusual. In this delightful spot that was bathed in winter sunshine that took the edge of the cold. Around four or five in the afternoon, the fog rolls down into the vineyard, but we were there at a little after ten and the bare vines were spread out beneath a sky of unmarred azure. We tasted the 2013 Chardonnay and 2014 Pinot Noir. Mary provided bread with a dish of her olive oil to go with the tasting. The oil was soft with a light spice. The Chardonnay, whilst served slightly too cold did offer an aroma of lemon and green apple. The first sip revealed a crisp acidity with a subtle mix of apple, pear, and gooseberry. This was the antithesis of a California Chardonnay; no smooth butter and vanilla. This is a wine that would accompany spicy or fried food, thanks to that marked acidity. The Chardonnay sells for $35.75. California Girl comments: This Chardonnay really reminded me of those I just tasted when I was in the UK. It had that same minerality, earthy texture and gooseberries on the palate. It must have to do with the cool climate and fog in both places that gives it that unusual flavor profile. The Pinot Noir had a pale, translucent red colour. The nose was a splendidly complex mix of redcurrant, earth, and citrus. The acidity was low for a Pinot, especially when compared to the sharp notes on the Chardonnay. The flavours were a match for the diverse nose; cherry dominating, but backed with orange, cinnamon, nutmeg, and all wrapped in a savory smokiness. The wine sells for $58. California Girl comments: The Pinot Noir was almost a light cherry in color. It was bright and translucent in the glass. Despite its lightness in color, the it was packed full of flavor. I enjoyed my sip, and we bought a bottle. 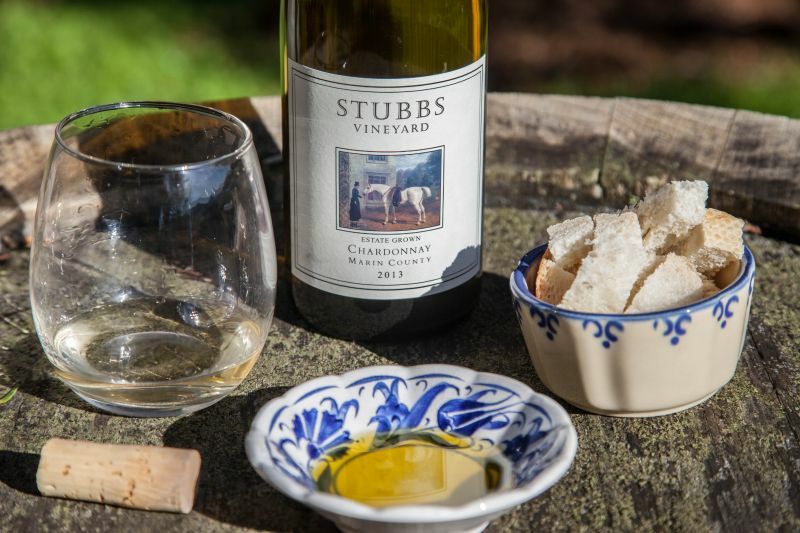 Stubbs makes just two wines, but they are both individual expressions of these familiar grapes. Demonstrating, how different locations and approaches can produce fundamentally different wines. California Girl comments: It is discovering interesting people and places like this that makes blogging worthwhile. I hope you try a bottle of Stubbs for yourself. They sell through their website and they have a wineclub. OMG! I am in love with that building!! The whole property was so unique. 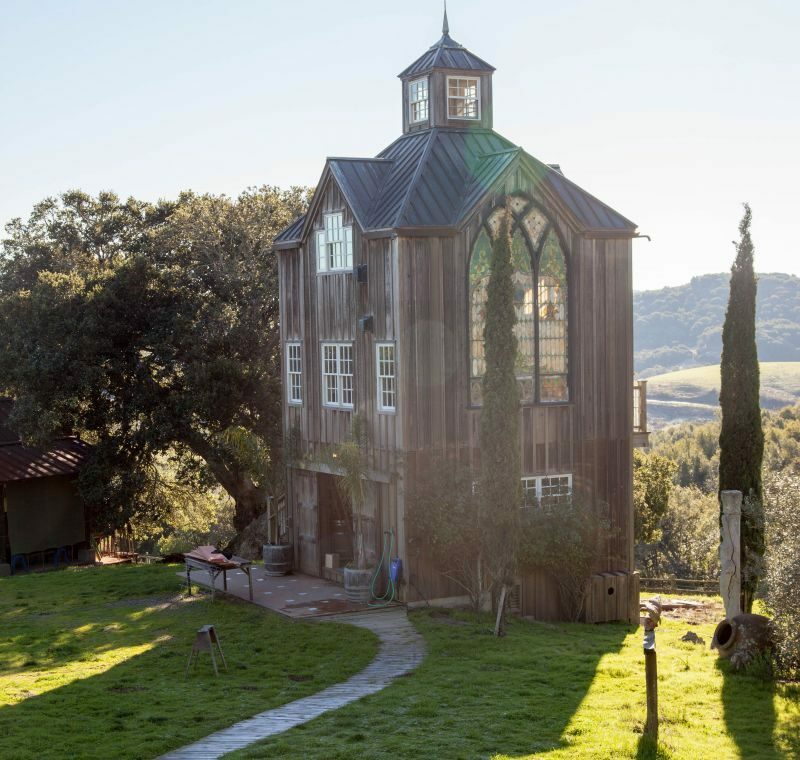 One of the things that I didn’t show or photograph was the “Gate House” It was so unbelievably cool and you can actually rent it out on AirBnB. These people have amazing style.